More for Easter at CityWest! Bring your little ones down to the Mall on Easter Saturday and start Easter weekend off with tons of fun! 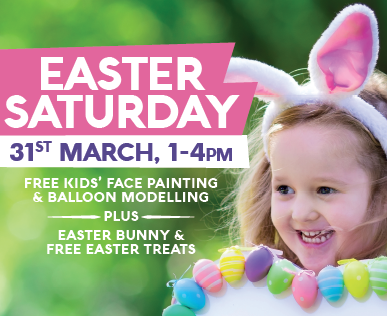 Enjoy free face painting and balloon modelling on the mall from 1-4pm, and meet the Citywest Easter bunny, who will be handing out delicious Easter treats. Keep an eye out on our Facebook page for our egg-cellent Easter competition. You could win an extra special Easter hamper!